First issue of "All The Year Round"
From 1859 until his death in 1870, Charles Dickens ran a weekly magazine called All The Year Round. It’s where A Tale Of Two Cities and Great Expectations were first serialized, alongside works by contemporaries like Elizabeth Gaskell, Wilkie Collins, and Edward Bulwer-Lytton, the largely forgotten bestseller king responsible for coining phrases like “the pen is mightier than the sword,” “the almighty dollar,” and the notorious “It was a dark and stormy night.” After Dickens’ death, All The Year Round was taken over by the writer’s eldest son, who used it to publish works by the likes of Anthony Trollope and Sheridan Le Fanu. It was, in other words, a happening place for Victorian literature. But, as was the standard at the time, many of the articles, essays, and poems in All Year Round ran without bylines, leading to over a century of literary speculation. Now, a bound set of the magazine has been found, bearing annotations in what appears to be Dickens’ handwriting, which reveal the names of hundreds of contributors. As The Independent reports, the notes were discovered last year by a Welsh book dealer named James Parrott. They had previously been owned a wealthy family that may have acquired them after the magazine folded in 1895. The notes reveal that some of the marquee names at the magazine, including Gaskell and Collins, also contributed previously unattributed shorter pieces, and that many of the articles previously attributed to Dickens were written by others. There is also evidence pointing to that a poem published by the magazine may have been written by Lewis Carroll. Besides the possibility of a previously unknown work by Carroll, the biggest surprise from the notes is the sheer number of women who wrote anonymously for the magazine, making up as much as 40 percent of the writers. Eliza Lynn Linton—the anti-feminist who has the distinction of being the first female journalist in Britain to hold a salaried position—had over 100 articles published anonymously in the magazine. Altogether, the notes reveal the identities of between 300 and 400 writers, offering a cross-section of who knew who in the London literary circles of mid-19th century. 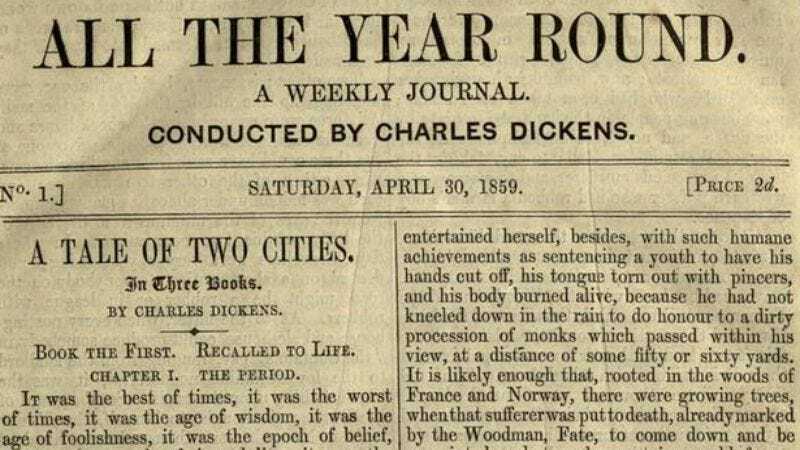 Previous efforts to crack the identities of the All The Year Round contributors have included computer style analysis, leading many anonymous articles—now known to be by other authors—to be misattributed to Dickens, who took a hands-on role in editing the magazine and didn’t think twice about re-writing a sentence here or there.